After hearing that Niseko’s snow had not quite been up to usual standards, we were more than pleasantly surprised on Wednesday. There were 11 inches new snow plus it snowed intermittently through the day. The One Niseko Towers hotel has a limited number of shuttle buses to the Annupuri base 3km away. I did not get up in time for the first 8:15AM bus and thus got on the 9AM bus. I got on the wrong bus, going much farther to the Hirafu base, and thus did not get on the mountain until 9:30AM. I took the 3 Ace lifts to get up top and skied in the light fog to what I thought was the top Annupuri lift. It was in fact the Wonderland lift above the Niseko Village gondola. Despite the bad navigation, the snow above treeline was barely tracked at 10AM. I finally reached the Jumbo 4 lift and headed to the G1 gate to ski the trees in the Annupuri sidecountry. Snow was comparable to what we had skied at Furano and Kiroro but with much longer fall lines, over 1,000 vertical untracked from G1 and nearly 2,000 from the G2 gate at the top of Jumbo 4. That gate was open with a break in visibility on my next lap. The G2 was a direct traverse when I was here in 2011 but now has a ~100 step bootpack before you can start the traverse. I suspect this is due to less coverage as there were some branches and sasa grass blocking lower entries. Jenny had made the 8:15 bus and skied a couple extra untracked runs with Chris before I got on the mountain. 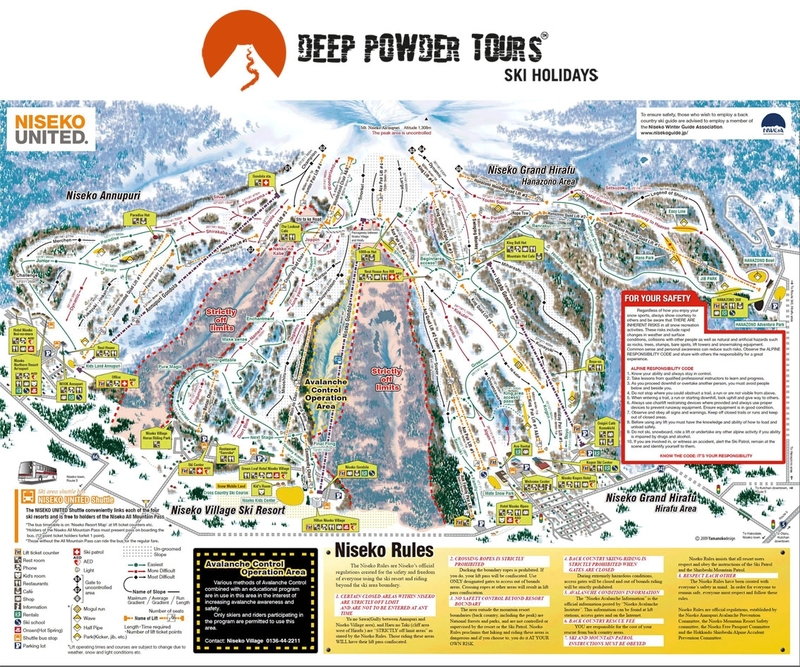 I skied more alpine powder to Hirafu and met Jenny at the gondola about 12:15. We intended to ski to the Boyoso restaurant for lunch but were lured into the Miharashi trees and got too low. We made it to Boyoso the next time. After lunch we went up top via King 4 and I skied into the Hanazono sidecountry above Gate 5. I followed untracked lines to the north, eventually into one of Niseko’s ravines. However I knew from my prior trip that I would intersect a plowed road, which you must hike up to return to the Hanazono pistes. The hike was 15 minutes, and as it was cold and snowing I neglected to remove my goggles. By the end of the hike I was no longer cold and the goggles developed condensation that did not show up immediately but became a real PITA the next day. I barely made it back up the 4 chairs from Hanazono before 3:30 closing of the top lifts. The alpine remained powdery as I crossed to the Annupuri side. I skied into the G7 area and was delighted to find mostly untracked as it had been neglected in favor of the larger sidecountry areas. This put me at the Annupuri gondola and Jumbo Quad but below the base area bus stop. I took a run on the chair to avoid the uphill walk. I arrived at the bus stop at 4PM only to find that the Niseko One bus departure times were 3:45PM and 5:10PM. I took 3 more runs including one more into G7 before quitting at 4:30. My only pic of the day is at the end,overloooking the Annupuri base under the lights. Liz and Mary had taken the day off skiing and taken our rental van to Otaru. They were on their way back and picked me up just before the Towers bus would have. This was an impressive day of 23,200 vertical, 11K of very high quality powder, and it could have been more If had got up in time and gotten on the proper bus. However, I’m only halfway through 12 consecutive days, so there is plenty more to come. Thanks for the reports so far. Looks like a great trip with good snow and good company.